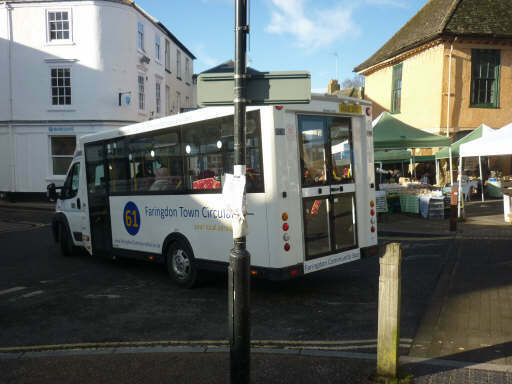 Community transport - Faringdon Community Website. Regular shopping trips Tuesday and Friday to Faringdon. Leaves Buckland at 9.30 am and calls at Hinton Waldrist, Longworth, Littleworth, returning from Faringdon at 11.30 am. Also monthly trips to Wantage and Witney (extended shopping time).Available for private hire for local groups. Area served Oxfordshire and surrounding counties. For clients/passengers unable to use public transport due to age or disability. Activities British Red Cross provides car, minibus or ambulance transport to most of the county. Also longer journeys. Operates the Number 61 timetabled service in and around Faringdon and Coxwell every weekday morning except Bank Holidays. The service is available to the whole community and passengers with concessionary bus passes travel free after 09:00am. A programme of trips to local towns, places of interest and events in the area is also organised by FCB Ltd – details of this can be obtained from the Community and Tourist Information Centre, Faringdon: 01367 242191. The Faringdon Community Bus is also available for private hire. The bus has 16 passenger seats but is not fully accessible to wheelchair users. Folding wheelchairs can be accommodated but all passengers must be able to ascend steps to enter the bus. Offers information on transport in your area. bookings to members for social and pleasure purposes. Membership is open to individual residents, groups and clubs in Uffington, Baulking and Woolstone. Those who can use the minibus must live in the local area and the users must not be established for profit-making purposes. Activities For the elderly and infirm for journeys to day centres, local surgeries, local clubs, health centre, Oxford hospitals, local shopping.